For more than 20 years, Carolina d’Ayala Valva and her partner Walter Cipriani have been decorating interiors from their atelier in the historical center of Rome. 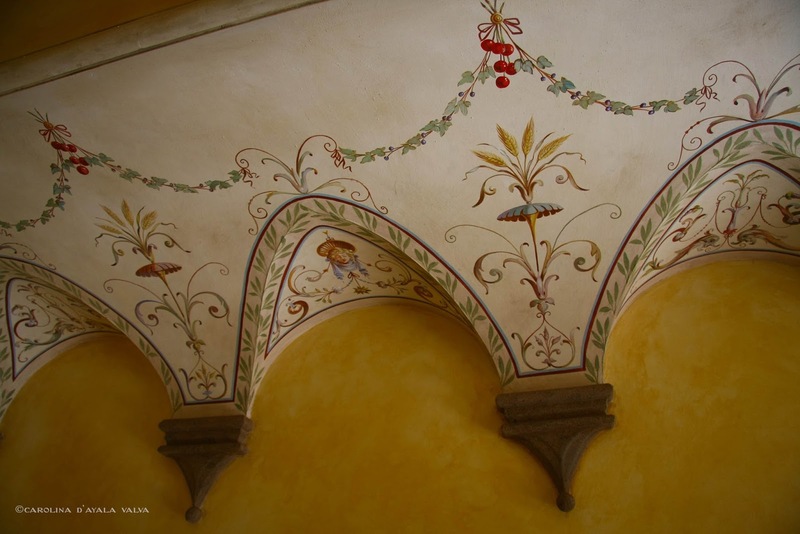 Carolina has become known as a modern-day champion of Grottesca (also called grotesque), a style of ornament first made popular by the Renaissance artist Raphael, and literally wrote the book on the techniques and use of this historic form. 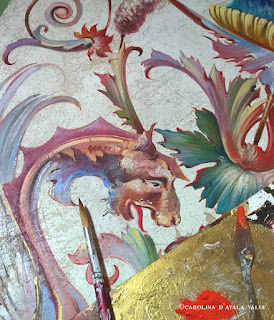 Walter excels at the important and age-old techniques of scagliola, and this talented couple are highly in-demand for decorating prestigious interiors from Rome to Paris to St. Petersburg. 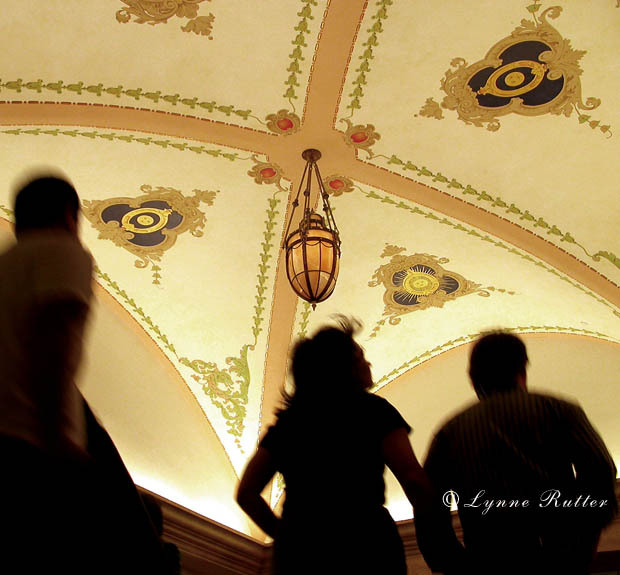 I met them at the Salon, an international gathering of decorative artists who meet in a different city each year. What impressed me most wasn't just the mastery of historic techniques, but the fresh and relevant way these techniques are being used in their work. Recently, the famous French wallpaper manufacture Zuber commissioned new wallpaper designs from each of them, which has in turn led to the creation of a new line of fabrics and accessories for interiors, called Nina’s Home Artists for Textiles (named for their inspiring dog, Nina.) Cushions, lampshades, and table linens are printed on natural fibres, entirely made in Italy. 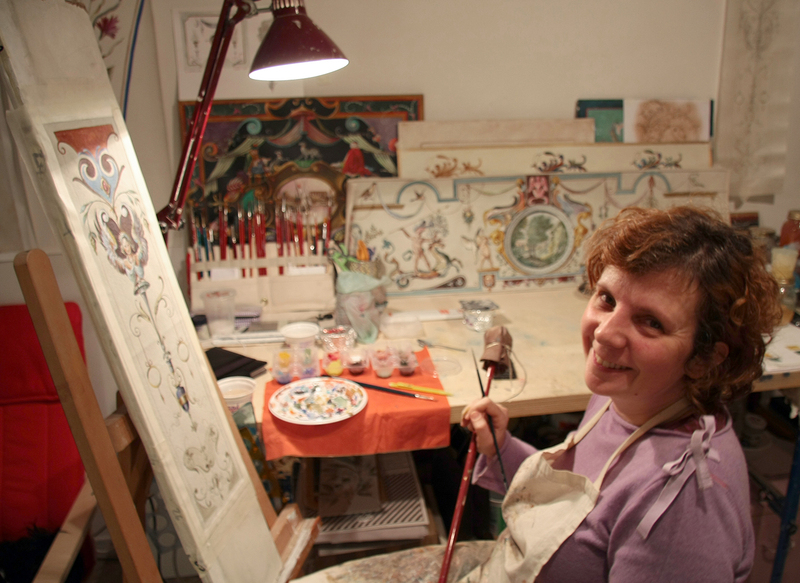 Carolina d’Ayala Valva is also a highly skilled and sought-after teacher of painted ornament, and I have invited her to my studio in San Francisco for a week-long workshop on the art of Grottesca later this year. Here she is interviewed for The Ornamentalist. Get to know the work of this exceptional decorative artist! Please tell me about your education and training. How did you learn to paint like this? 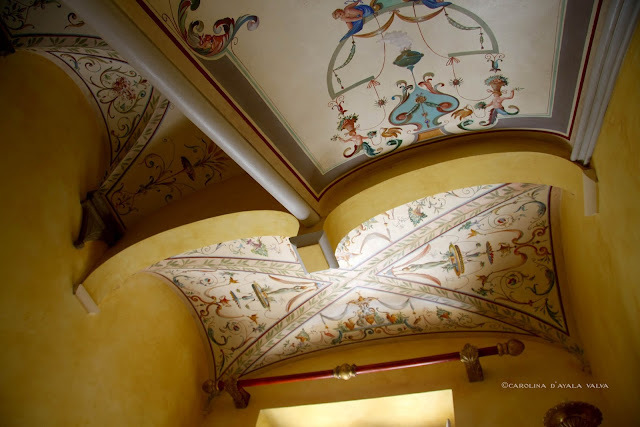 I did not start my professional career as a decorative painter, but as an architect. Architecture was not my first choice, but an alternative to my desire to attend the Academy of Fine Arts. However, it is thanks to the long university studies that I have design discipline, which is also very useful in my work as a decorator. So in the end, I'm a self-taught. Was there any one person or place that inspired you to become a decorative artist? 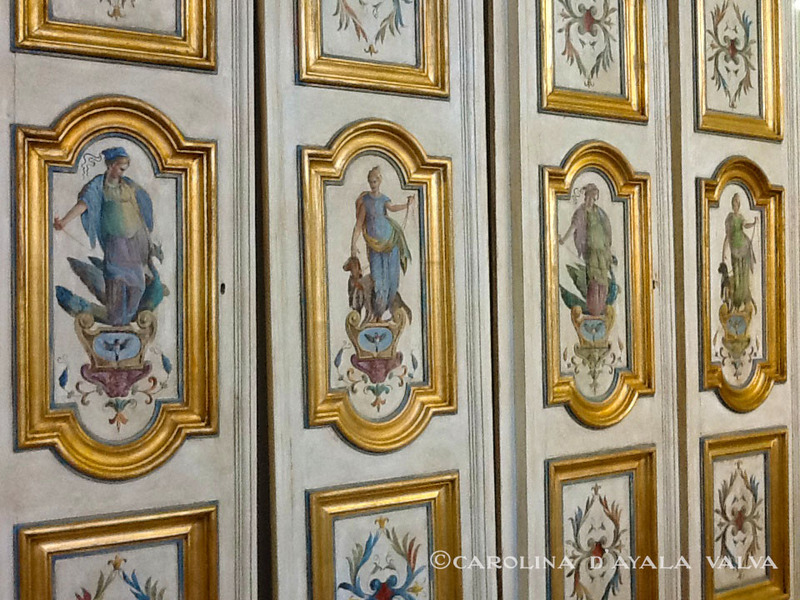 Living in Rome, surrounded by a unique artistic context in the world, inspired me deeply. It’s especially here that I could cultivate my passion for the “Grotesque” design. Our Atelier (L’Artelier-Roma) was two steps from the Vatican City and, in the past, I have often had the chance to see up close the Grotesque decorations in the halls of the Vatican Museums and the loggia of Raphael, which are the first and most famous in the world. I have been able to admire the beauty, the harmony of the colors and the fast but masterful brushstrokes of the artist. For all this I consider myself lucky. Over time, though I was immersed in a wonderful classical context, I tried to develop a very personal style, both in the use of the color and in the design’s style. I also love to try more contemporary sources of inspiration that can be anywhere in the life of every day, inserting modern elements in the classic structures. Which are your favorite materials/medium for painting? favorite brushes or tools? 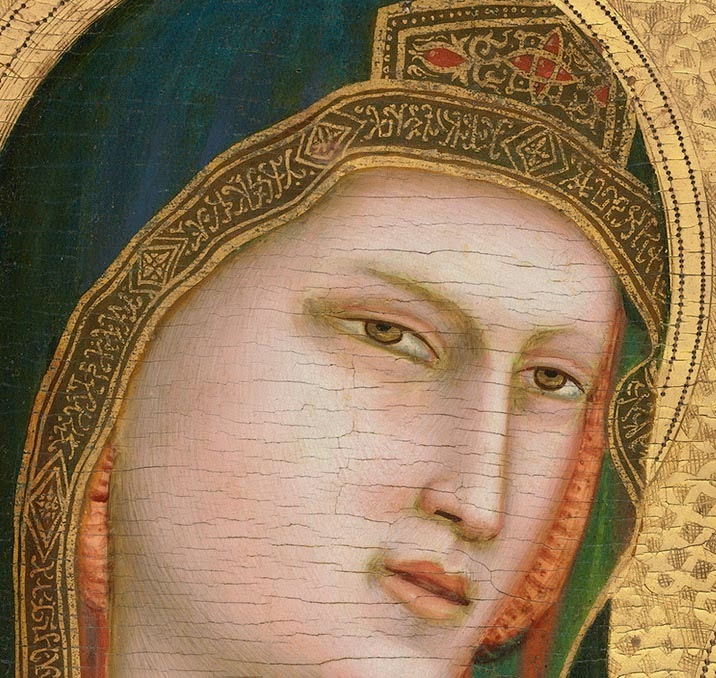 My favorite technique for painting, is the egg tempera. I also use it for painting more contemporary subjects, in fact, is my personal opinion, that the egg tempera has no equal for beauty, brilliance and color depth. The egg yolk binder gives a softness and a flexibility to the brushstroke, truly unique. 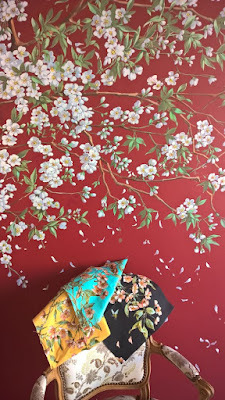 The binder allows the use of pure powdered pigments, these offer the possibility of having an infinite palette, rich in nuances that gives to the work so realized, the sumptuousness of the paintings of the ancient masters, performed with the same technique. Of great importance in the use of this type of tempera is the choice of right brush, the right brush, leads to having an elegant pictorial gesture, soft and sinuous. I use round synthetic brushes, very flexible and highly accurate. Some of Carolina's fabric designs made into tote bags! What's new? favorite recent projects? I worked for years painting Grotesque decoration work on ceilings, furniture and panels for important clients in several countries. So much work and experience led me to publish a book: "Art et Techniques de la Grotesque" (Editions Vial, 2009) and this made my work widely known around the world, encouraging also my activity as a teacher in Italy, France, Belgium and the U.S. In 2013, as a result of the popularity of the book, Zuber, the famous producer of papier peint, contacted me for a partnership in order to create a new collection of wallpapers inspired by my Grotesques. And this was the impetus to start building my collection of printed digital fabrics with the brand: Nina’s Home Artists for Textiles. Please tell us a bit about the process of designing for textiles. Each design is first painted by hand as a work of art in a single original water-colored model. Then, the quality of the digital printing process allows us to reproduce the slightest nuances and brushstroke on the fabric, preserving the charm and originality of our hand-painted model. As mentioned above, modernity and tradition, this is the right mix today to further our art. Nina's Home Artists for Textiles shop on-line. Carolina creates grottesca that is almost edible! So happy she is coming to teach at your studio Lynne. yes it's been ages and I'm very excited to have her visit here!